Sometimes I will pick up items of clothing that will stay in my wardrobe for months before contemplating them, partly because they haven’t quite found the perfect accompaniment and partly because I am a compulsive shopper. Other petite ladies will understand the woes of getting the lengths of clothes perfected; what looks gorgeous on the leggy model sometimes looks a little drab on our short frame. This duster jacket from F&F was a bargain find however seemed to be a difficult length to style. I liked the freedom and exposure from the shorter sleeves, but wanted something the same length or shorter to reside underneath. After months of umming and ahhing over getting rid of it I hit the jackpot with the Missguided sale picking up an outfit for under £10, and one that I could style with my duster coat! Khaki will leave you pondering a love hate relationship. Sometimes I think it looks far too bleak, masculine and bland, and other times I find the perfect piece and fall head over heels with it. My Mum was someone who would always wear black, khaki and neutrals without fail, yet always managed to keep timeless pieces and therefore I think it is something that I will continue for wardrobe staples. Florals will always be relevant, like it or not. A winter floral can look moody and autumnal, and a bright floral can follow you through Spring and Summer no matter what the current trend. This zip back crop fits perfectly and is so comfortable, definitely a transitional piece. As for the boots there may be a few eyebrows raised, or perhaps a few loving them. I never try and falsify my height, and I am not great at walking in heels, however thanks to the rubber sole and sturdy platform these feel basically weightless. You don’t feel like you are walking with extra inches yet get that extra lift. PURRRRRFECT. I like to lug my Urban Outfitters rucksack with me everywhere. A leather bag for £15 in the sale has to be cherished, and who wants an aching shoulder from an overfilled tote anyway!? Tags: black duster coat, brown hair style, cleated soles style, comfortable platform boots, f&f duster coat, how to wear khaki, khaki skater skirt, make yourself look taller, missguided floral crop top, missguided sale bloggers, missguided sale picks, natural hair, petite clothes, petite coats, petite duster coat, petite outfits, style a duster coat, styling a leather rucksack, styling florals in winter, styling skirts in winter, tesco clothing outfit, the khaki trend, under £5 clothes, urban outfitters sale bag, winter 2015 style, winter 2015 trends, winter petite outfits, worthing fashion bloggers. south east bloggers. Bookmark the permalink. I have platform boots like that and I absolutely love them – they’re so easy to walk in! I love this whole outfit so much! Oh, Jessica, this combo is fabulous. You got the perfect ensemble. I have that exact top and skirt! Got it in the sale as well, heheh 😛 I know exactly what you mean about finding coats/jackets that aren’t awkward on a petite frame – either the sleeves are way too long or they drown you. Absolutely love that black duster coat though! Looks gorgeous on you & I like the shorter sleeves! 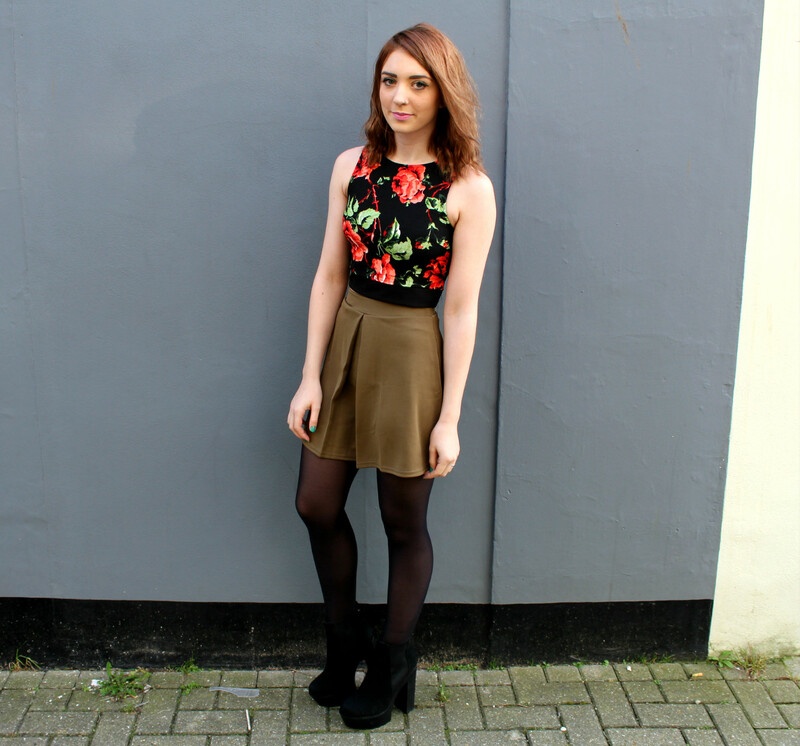 I love the outfit, the floral droptop with the khaki coloured skirt is perfect! You have an amazing figure too! cute otufit, I really like your skirt and your top! I love this outfit, the darker khaki is perfect with the black! This is a really cute outfit, and i’ve gotta love your boots. I worked on the shoe dept in Primark and other day and I fell in love with that style! I love the whole outfit, especially the skirt and duster coat! Can’t believe the skirt’s only £4! 3/4 length sleeves are so hard to style! But this outfit definitely works 🙂 the boots are gorgeous! Loving this outfit! 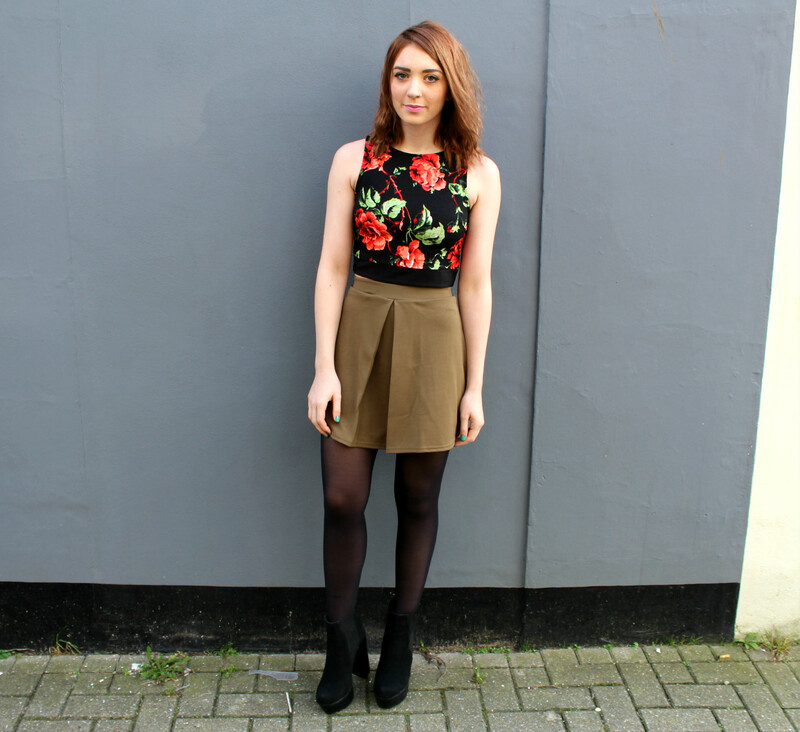 The khaki skirt looks great with the floral top and I also love the boots. I also have the same problem being petite, the hardest thing for me is buying maxi dresses as they usually are all twice the length of me! Lol. I’m new to your blog, but that outfit is on point! It doesn’t make you look petite at all, I’ve always avoided khaki but will definitely give it a chance now!